After a crazy Elite Eight, we are down to the Final Four of the 2019 NCAA Tournament. The second weekend took out some of the top seeds in the field, including No. 1 seeds UNC, Duke and Gonzaga. No. 3 seed Purdue and No. 2 seed Kentucky both fell in overtime. Of the four teams remaining, only Michigan State has a rich Final Four history. Texas Tech and Auburn are in the Final Four for the first time in school history and Virginia has not made it this far since 1984, and have never won a Final Four game. Let's now take a closer look at the matchups Saturday, with the Final Four field now set. The skinny: Auburn showed in the Elite Eight that it does not have to shoot lights out from 3-point range to win games. The Tigers only made seven 3-pointers against Kentucky, but was able to force 14 turnovers and get to the free throw line 24 times. Auburn is ranked second in the country in turnover margin. Jared Harper and Bryce Brown combined for 50 points against the Wildcats, with Jared Harper scoring 12 of his 26 in overtime. The Tigers are without Chuma Okeke, its third leading scorer, in the Final Four, who tore his ACL in the Sweet 16 win over UNC. The skinny: Virginia may have given up 75 points to Purdue in the Elite Eight, but this is still the best defensive team in the country. The Cavs have only given up 55.4 points per game this season, the lowest in the country. Opponents have struggled to shoot 3-pointers against Virginia, knocking down only 28.7 percent of its looks. On the offensive end, this team has many different weapons. Through four games in the tournament, the Cavs have had a different leading scorer every game. This team also does not turn the ball over too much. Its nine turnovers per game is the least in the country. 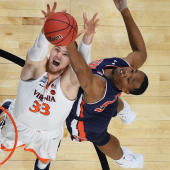 Virginia has struggled to shoot 3-pointers in the tournament, connecting on only 29.9 percent of its attempts, but this team was one of the most consistent team's from deep this season and has the ability to flip the switch. The skinny: Chris Beard's team has relied on its defense all season. It is ranked in the top five in scoring defense and defensive field goal percentage this year and it has showed in the tournament. The Red Raiders held Michigan to 44 points in the Sweet 16, the least the Wolverines scored since 2014. Jarrett Culver is the team's all-around best player. The projected lottery picks lead the team in scoring, rebounds, assists and steals. Around him, it has gotten solid production from transfers Matt Mooney and Tariq Owens . Davide Moretti is also one of the best shooters in the nation, shooting 46 percent from 3-point range this season. The skinny:The Spartans took down Duke 68-67 in the East Regional final to advance to the Final Four for the first time since 2015. After a 22-turnover performance against Minnesota in the second round, Michigan State has recorded only seven turnovers in back-to-back games. It has not lost a game this season when it has single-digit turnovers. Sparty is one of the best passing teams in America, averaging over 18 assists per game.